Stampede Presentation Products has launched a new line of turnkey, fully assembled, out of the box UL Listed digital kiosks. Powered by kiosk manufacturer United Visual Products, this next generation of digital kiosks are designed to be a sleek, simple, easy-to-use solution for every type of kiosk installation. Stampede Presentation Products has launched a new line of turnkey, fully assembled, out of the box UL Listed digital kiosks. "When shopping for a product end-users want the kind of clear-cut options and pricing information that retail kiosks can provide," explained Stampede president and COO Kevin Kelly. "Until today, however, the process of sourcing the components for kiosk installation and configuring it for custom applications has been a cumbersome, time- and labor-consuming exercise. Our strategic partnership with United Visual Products effectively removes the guesswork from this process and makes the installation of revenue-producing kiosks a simple and practical reality for every type of customer facing environment." According to Kelly, customers will now receive a complete package that includes an interactive touch screen kiosk, a lifetime touch screen software license (no annual renewal), and all other required hardware for one set price. Using the included touch screen software, installers can remotely create and manage an interactive kiosk. This will build customer loyalty, can capture customer email opt-ins, provide interactive way-finding, serve up information, and display a customer's entire catalog in one place. Additionally, Magento based websites can also be integrated into these touch screen kiosks. The Remote Access Digital Kiosks allow network managers to remotely control an unlimited amount of kiosks from one and/or multiple locations. With the ability to display any combination of static advertisements, videos, commercials, weather & news forecasts, RSS feeds, QR Codes and more, these kiosks are ideal for any high traffic commercial setting. Each commercial grade digital kiosk comes with a lifetime software license (new annual renewal) and all other required hardware. The Plug & Play Digital Kiosks are ideal for small businesses looking for a cost- effective solution to promote and advertise to their customers or patients. Using the included Ad Player software, content can be scheduled and uploaded using a USB thumb drive. These kiosks are a great entry level to digital signage and at any point you can upgrade to remote access. Both digital kiosks come with pre-installed, tested, and fully configured commercial grade internal hardware components. 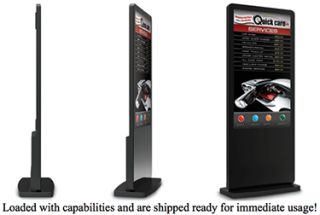 The S-PVA Technology enables an easy, crisp, sharp, and clear viewing of each kiosk's content from any angle. Equipped with a built-in advanced media player, storing and playing videos has never been easier. The media player can also store scrolling text messages and animated graphics. The 2-inch, RAZOR thin kiosks are crafted with a sturdy, long-lasting powder coated metal cabinet and feature high-impact, commercial grade tempered glass to ensure extreme durability. With built in temperature sensors, the advanced intelligent internal cooling system exhausts heat, which adds years of usability to the screens. Also, each kiosk comes with secure lock and theft protection to ensure the product's safety. Each screen comes with a commercial grade LCD panel and LED back lighting to produce a longer life. Designed for high heat dissipation, the screens can operate 24/7 and are rated for 50,000 hours of continuous play. If the screens do not need to be consistently powered up, the digital sign scheduling software allows users to program content to play on a specific day or time. The auto on/off feature also allows users to schedule specific times for the kiosks to power on and off. Third-party software and media players such as BrightSign, SCALA, Four Winds Interactive, and BroadSign are fully compatible with these kiosks.